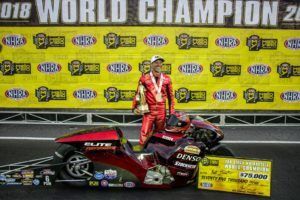 Special congrats to our friends Matt Smith and the entire Matt Smith Racing Team. 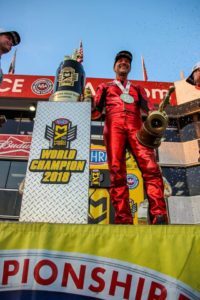 Matt was able to take home the 2018 World Champion title from the NHRA Finals along with the fastest pass in NHRA Pro Stock Motorcycle history. We are happy to have played a small part in his start this past season. He is an excellent example that just goes to show how much hard work pays off. A huge congrats and thanks again for taking us along for the ride that lead to your championship season. This August, Kenny from Kenny’s Components was able to make the trip out to the Bonneville Salt Flats in Utah. The Speed Demon is a car created for the streamliner class, one of the fastest classes. The Speed Demon is setup to run over a 5 mile course in the hopes to break speed records. The entire body of the car was fabricated by Kenny’s Components in order to incorporate carbon fiber’s light-weight material into aiding the car to reach top speeds. This year, the Speed Demon topped off with a speed of 464.246 mph. 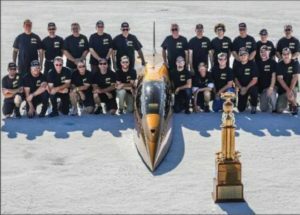 While the team did not win the Hot Rod trophy, an award that goes to the fastest vehicle at Speed Week, this year, they were still able to break the car’s personal speed record. Congratulations to this year’s Hot Rod trophy winner, the Vesco Team’s Turbinator II. Special thanks to ARP, Chris Raschke, and Maxwell Industries. This experience is one that we are thankful to be apart of every year. We are looking forward to the many more years and achievements to come. 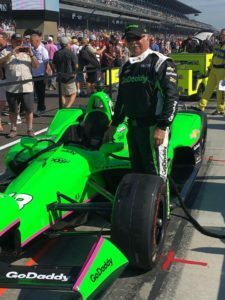 This May our own Kenny Koldsbaek of Kenny’s Components was fortunate enough to travel to the 102nd Indy 500 Race. 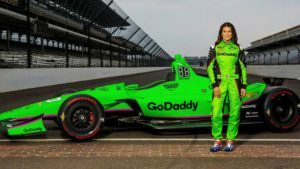 Kenny was able to work with Ed Carpenter Racing and be a part of the Danica Patrick team. While Danica did not finish as the team had originally hoped for, it was still a pleasure to be a part of her team. 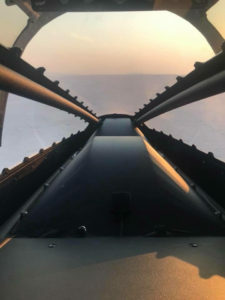 It was an honor, and he is proud to have been a part of her last run. Special thanks to Ed Carpenter Racing for being a great group of guys and allowing Kenny to feel like a real member of the team. This past year, we were asked to create a carbon fiber part that would later become a part of history. 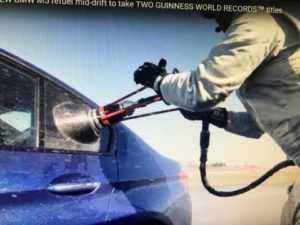 On December 11, 2017, Johan Schwartz was able to drift a BMW M5 Sedan for 232.5 miles, taking approximately 8 hours to complete. This would become the new GUINNESS WORLD RECORD title for greatest vehicle drift. In order to make this happen, the gas cap was essentially moved to the left rear-window in order to refuel. 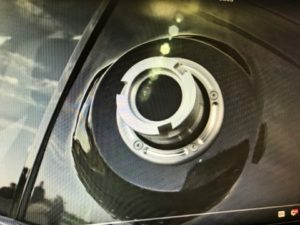 Kenny’s Components was asked to create a carbon fiber replacement panel made to hold the dry-break refueling system in place to make refueling easier WHILE Johan was still drifting. 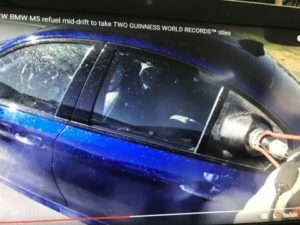 There was a total of 5 refuels successfully performed throughout this record breaking drive. We are honored to have been able to help with something so simple yet so essential. A Guinness World Record was made with our help. Just goes to show that even the slightest bit of work can go a long way. Thank you to everyone who made this possible and all of those you enjoy keeping up with our progress. It was a pleasure for us to receive a call from Ray Everham to have us install one of our JL1 composite seats into his newest project, a 36-Chevy Sudan. Ray and Kenny, of Kenny’s Components, first met in 1993 when he first worked for the Rainbow Warriors. Over the years they’ve managed to stay in contact, leading to our contribution on his project, “The Ghost”, that was debuted at the SEMA show in partnership with Valvoline. We are looking forward to watching “The Ghost” race in the upcoming months. 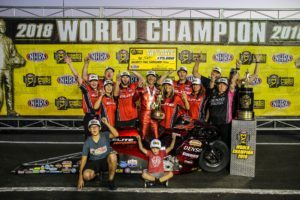 2017 was a wonderful year for the George Poteet Speed Demon Team. Going into speed week in August, the goal was to get the A/BFS Record and the HotRod Trophy. The A record was accomplished at the beginning of the week. The HotRod trophy was obtained at the end of the week. 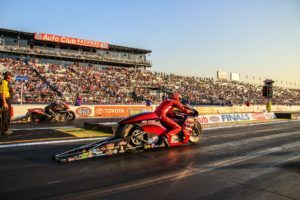 The Steve Watt/Kenny Duttweiler-led crew ran a top speed of 453.876 mph at the exit of mile five (out of the five-mile long course), with a 438.643 mph average for the last mile, the top speed of the meet. Kenny’s Components was able to contribute by building the body and all of the composites on the car. Our own Kenny Koldsbaek was an integral part of the crew. 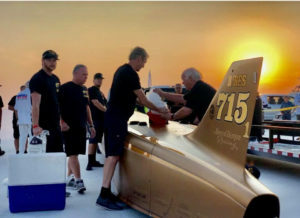 We would like to congratulate the Speed Demon Racing Team and driver George Poteet who captured the Hot Rod Magazine Top Time Trophy for the seventh-straight year during Speed Week at the Bonneville Salt Flats. The Speed Demon rocketed to a 438.643 mph pass. Summer Months are a busy time here in North Carolina, not to mention hot, 95° in the shade. A couple of the main things going on are the final development of a kid’s carbon fiber version of our JL1 racing seat and of course getting ready for the Speed Demon to hit the salt. 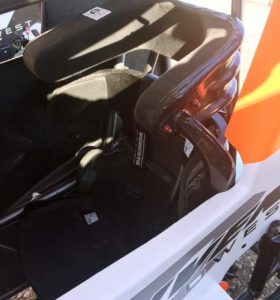 We have had a lot of success with our JL1 seat and have been getting many inquiries in regards to seats for the kids participating in events like the Tulsa Shoot Out, http://www.tulsashootout.com. We’re looking to have them available for this year’s shoot out Dec. 27 – Jan. 1, 2018. Be sure to keep checking back. 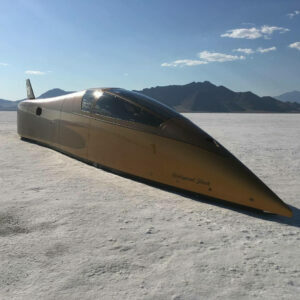 Time is fast approaching for the Speed Demon to hit the Bonneville Salt Flats. Steve Watt and everyone on his team have been working feverishly to insure the Speed Demon is ready to go. The Speed Demon has been a regular fixture for roughly 25 years. Last year was a great success for the Speed Demon Crew. For anyone interested, Bonneville Speed Week will be Aug 12th-18th 2017. Speed week consist of six days of racing, weather and conditions permitting. Entrants come from all over the world to participate in the weeklong event. Earlier this year, it was a pleasure to work with Matt Smith Racing and Polaris/Victory Motorcycles on their Pro Stock Motorcycle program. 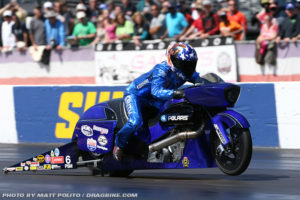 The motorcycle created is a bagger which is new to NHRA Pro Stock Motorcycle racing. The plug for this bike was made form plastic, fiberglass, aluminum, carbon fiber, and a lot of bondo. We took the motorcycle from a 2D drawing, through the wind-tunnel, to the racetrack. Currently, the bike has run 199.86 mph, not too bad for our first year as a new motorcycle. 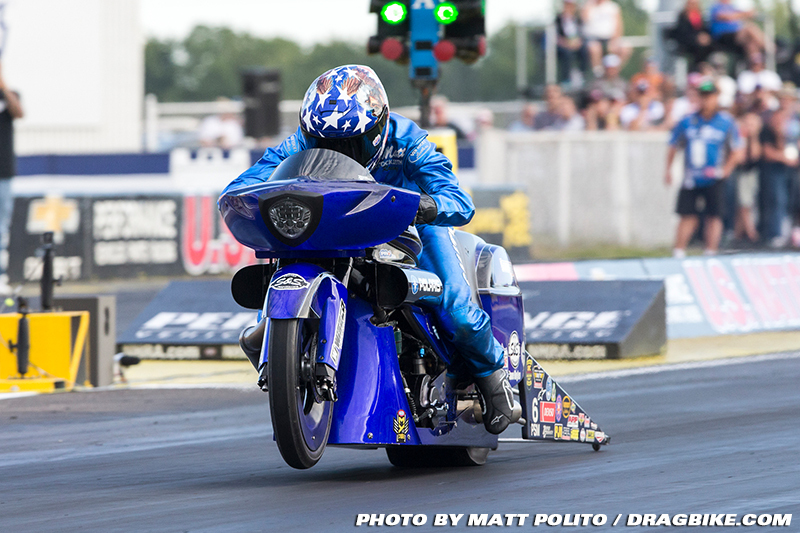 Looking forward to being the first Pro Stock Motorcycle to get to 200 mph. The SFI 39.2 Specification requires a demonstration that the product of a manufacturer meets or exceeds the requirements when the manufacturer enters the program; and on an annual basis thereafter. Kenny’s Components is proud to say that our JL1 Carbon Fiber Racing seat has once again met these requirements.